Launched in late 2011 by Stanford grad and ex-Facebooker Ishan Gupta and Indian Institute of Management grad Mayank Gupta, Delhi-based EduKart is on a mission to bring online education to India and the developing world. Today, the startup announced that it has raised $500K in seed capital from a handful of institutional and angel investors. Participants include Kima Ventures, AKM Systems, Vibhor Mehra and Stanford alumni. The investment adds to the $500K the startup had previously raised from One97 Communications founder Vijay Shekhar Sharma and Providence Capital Director Manish Kheterpal. With broadband penetration and smartphone adoption exploding around the world, particularly in India, Gupta sees a big opportunity for education. Over the last few years, he tells us, “we’ve seen enormous growth in the number of people in India making transactions online, the number of debit cards and, overall, a huge uptick in broadband penetration.” The convergence of these three trends has led to increasing demand for web-based learning applications and, while this demand (and the online education market itself) are still nascent, Gupta believes India is at an inflection point. 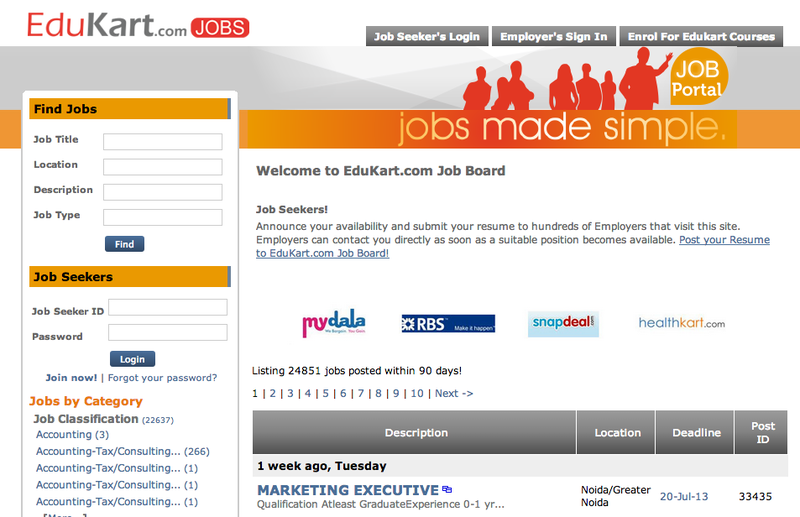 Unlike the hot MOOC platforms in the U.S., EduKart is pursuing a slightly different model as part of its approach to the Indian market. Every course on the platform comes with a price tag, which ranges from $20 to $2,400, depending on the level. EduKart is open enrollment, allowing students to pay for the course online and begin studying immediately, while providing them with phone and email-based support and an alumni group. The startup’s support staff is composed of paid subject experts, Gupta says, who are on hand to help students if they get stuck on particular problems by way of phone, email or text. The courses range from Telecom management to programming languages. The courses are created and taught both by EduKart’s content team and based on content it receives through partnerships with local universities. For now, the content is mostly slideshows, but includes a smattering of videos, documents and interactive materials. The platform requires students to complete assessments in between each exercise and complete a live, video-based final exam in front of a panel of EduKart’s teachers. Down the road, if EduKart’s educational model proves successful at home, Gupta says that he wants to begin looking beyond India to other developing markets in the region. Building a mobile platform and working more closely with publishers to create customized content are both part of the near-term roadmap for EduKart. EduKart may not have quite the same growth curve as the skyrocketing Snapdeal (the fastest growing e-commerce platform in India), but it’s a mission that’s easy to get behind and one that could have a big effect on education in developing markets.